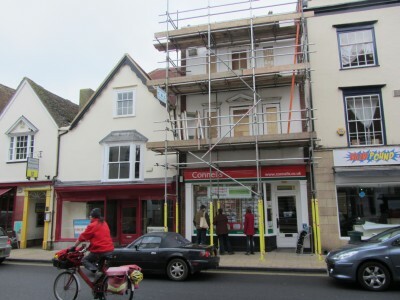 Good to see the ex Hathaways shop is now in a fit state to become a shop again. Looks like Connells next door is also being refurbished. 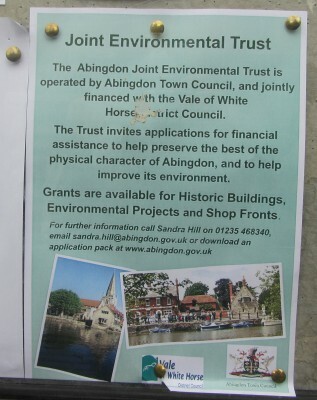 Grants from the Joint Environmental Trust (JET) can be used towards shop window improvements. 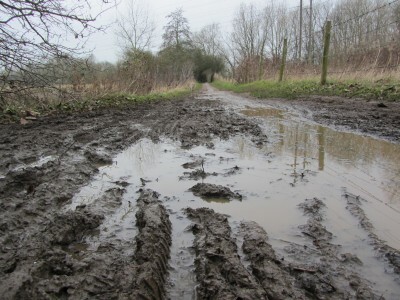 The area that looks like the pigs’ play puddle is the pedestrian route to Tesco from Chaunterell Way. The route was created when Tesco first opened in the early 1980s (corrected from 70s after comment). There is a picture in the library local studies section of a bridge at the Tesco end of the path being lowered into position in 1983. 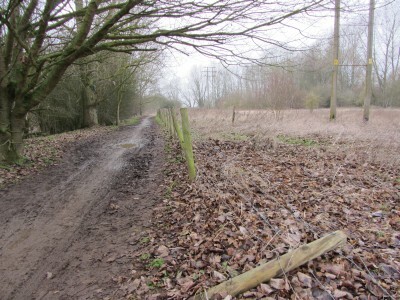 Not only is the path muddy a lot of the year, but the fence is falling down. 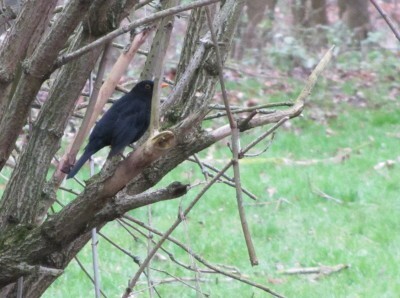 This weekend the RSPB are asking people to count birds in their gardens as part of a national survey. The winter has been mild so far. I have read newspaper reports suggesting that as a result birds have not needed to come to gardens for emergency food and that could skew the RSPB survey results. There are lots of birds about in Abingdon, but not many come to our garden, but then we have a cat, and so don’t feed them. None of these birds were seen in our garden. 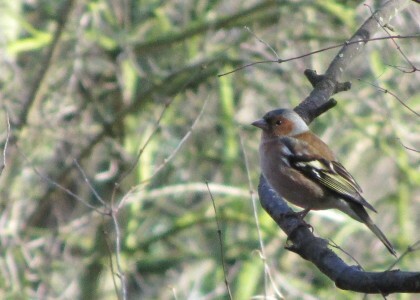 The chaffinch was near the River Ock. 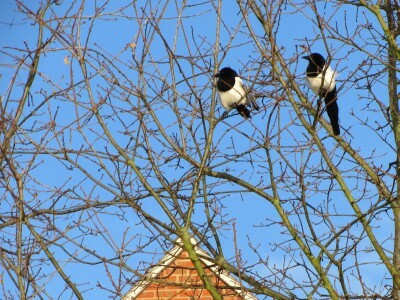 Two magpies in the Abbey Gardens. 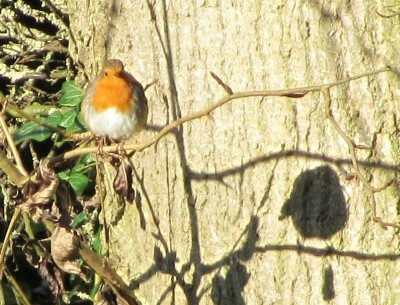 Robins are to be heard at regular intervals along the Ock Valley Walk and the Abbey Mill Stream. 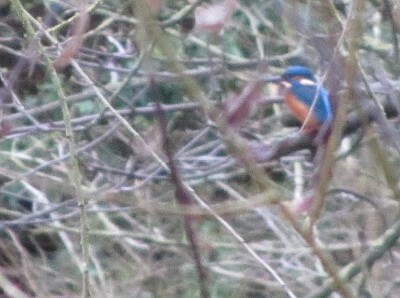 This Kingfisher did not stop long enough for me to get a clear shot but it did rest for a moment by the River Ock before speeding low along the river. 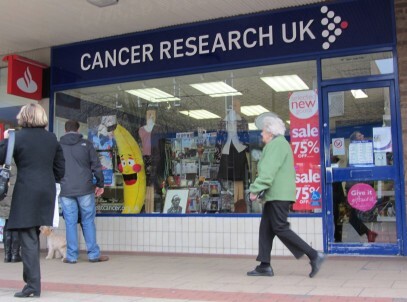 There is a large stuffed banana propped up against the window of Cancer Research UK. I would guess that it started off as a prize at Abingdon Fair, and has had a colourful life. 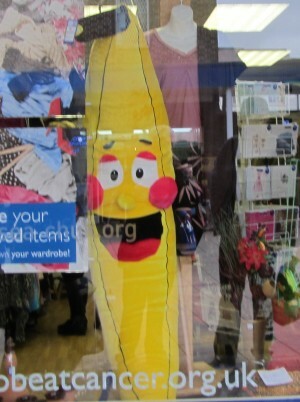 I heard some children asking whether they could buy it – as it was only £5. But the parents said there would not be room in the car with all of them and the banana.